All Transactions are made using PayPal for a secure and protected Service. Purchases can be made using debit/credit cards or PayPal account. Bulgaria has some of the highest biodiversity in Europe, which in turn gives the bees all they need to naturally produce the Best Pure Honey in the World. 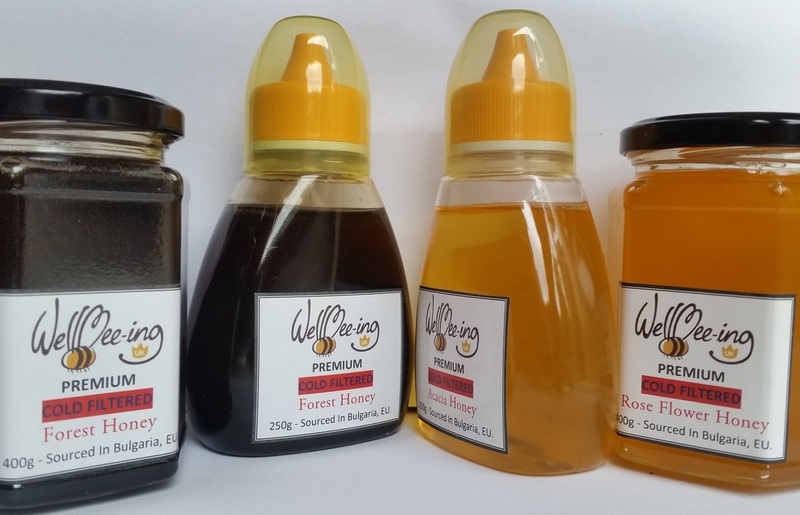 Our range of Premium Cold Filtered Pure Honey from a Single Estate (Our Bulgarian Bee Farm) are a connoisseur's dream. The process of cold filtering ensures that maximum nutrition, enzymes, antibacterial properties etc. are preserved. It is very rare to find cold filtered honey in local supermarkets. Bees are excellent at choosing the best flowers to produce maximum nutrition and our range is very special. The cold filter process also ensures maximum flavour producing a pungent, full bodied and complex honeys that leave a long lasting flavour on the tongue. Take 1-6 teaspoons a day. Can be mixed with yoghurt, on cereals, toast etc. All available in 250g Squeezy Plastic jar or 400g Glass jar. Suitable for diabetics due to the high fructose content and very low sucrose giving our Honey a low glycemic index rating.